The VWR Digital Orbital Shaker are made with high grade cast metal to with stand the test of time. The VWR orbital shakers can handle up to 40lbs while running continuously for up to one hour. The VWR Orbital Shakers function well for a wide range of every day lab operations including Tissue Culture, Diagnostic Testing and Solubility Studies. The easy to use digital controls are conveniently located in the front of the shaker allowing the end users to easily set up runs and walk away. This platform shaker comes with rubber mat and warranty. 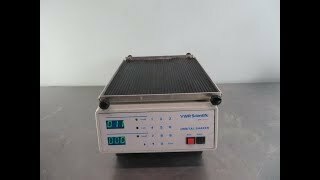 This VWR Digital Orbital Shaker 57018-754 has been thoroughly inspected and reached its max speed without issue. All of our lab equipment comes backed with our standard warranty. Should you have any questions, please don't hesitate to contact us.